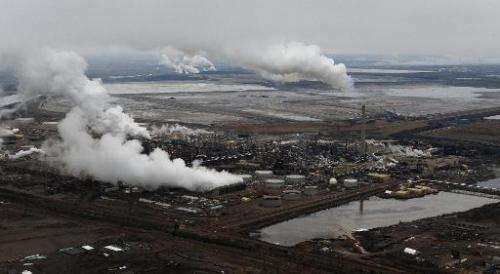 The amount of harmful pollutants released in the process of recovering oil from tar sands in western Canada is likely far higher than corporate interests say, university researchers said Monday. Actual levels of polycyclic aromatic hydrocarbon (PAH) emissions into the air may be two to three times higher than estimated, said the findings in the Proceedings of the National Academy of Sciences, a peer-reviewed US journal. Lead study author Frank Wania, a professor in the department of physical and environmental sciences, described the corporate estimates as "inadequate and incomplete." 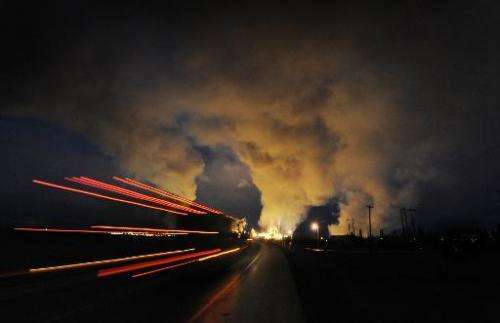 "If you use these officially reported emissions for the oil sands area you get an emissions density that is lower than just about anywhere else in the world," he told AFP. "Only with a complete and accurate account of the emissions is it actually possible to make a meaningful assessment of the environmental impact and of the risk to human health," he added. The research began as a term paper project by his student, Abha Parajulee, and was funded only by internal resources at the University of Toronto, he said. 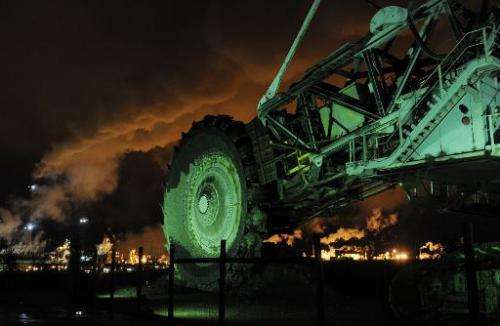 Parajulee examined emissions estimates from environmental impact assessments that corporations must file with the government before any new projects can begin to coax oil from the Athabasca oil sands. She compared them with measurements in the field by academic scientists and by the federal ministry of the environment, known as Environment Canada. The industry estimates were way lower than the actual measurements, apparently because they did not include any escape of PAHs from tailings ponds, which are engineered dyke and dam systems built near mining operations in the oil sands to collect the water, sand, clay and residual oil left over from processing. Until now, they were not expected to be a source of pollution. PAHs are dangerous chemicals created in the burning of fossil fuels, and some are considered cancer-causing. They can also coat meats and other foods that are char-grilled. "The physical properties of these substances are such that if you put them in water they will partition into the atmosphere," said Jonathan Martin, an associate professor in the department of division of environmental toxicology at the University of Alberta. "It was shocking to me to understand that current environmental impact assessments do not take this into account at all," said Martin, who was not involved with the research but reviewed it before publication. "It just shows how little we know," Martin told AFP. He said PAH measurements need to be taken above tailings ponds to confirm the modeling projections, which would require big oil's permission. Environment Canada is interested in the findings and has agreed to fund more research going forward, Wania said. 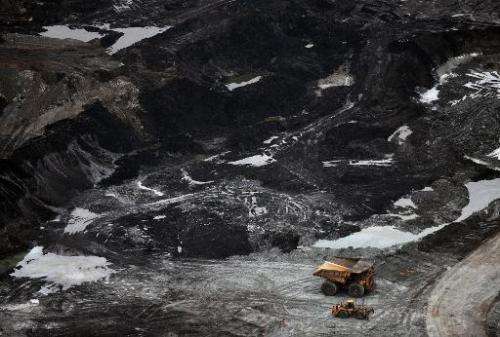 With the third largest crude oil reserves in the world after Venezuela and Saudi Arabia, Canada has predicted that oil sands development will bring in about $2 trillion over the next two decades. The US State Department's report on Friday raised no major objections to the controversial Keystone XL pipeline plan and said the pipeline would not in itself significantly increase greenhouse gases. The Keystone XL project aims to carry some 830,000 barrels of heavy crude a day from Alberta's oil sands south to Nebraska refineries before joining an existing pipeline to be shipped to Texas. It's not only the smart thing to do economically (high-tech jobs, and tech exports), but it's also the right thing to do for our planet. We would prosper more from a thriving high tech industry, than we would from a primary resource extraction industry. Maybe not in the short, but definitely in the long term. It raises our quality of life. Not all jobs are created equal. Also, building the Keystone pipeline or not, the oil will still flow. At this point, I find it extremely unlikely that oil sand production will slow, and it's much more likely that it will increase. I'm still not entirely convinced that a pipeline is safer than crude-by-rail. Either way, this pipeline is a small part in a much larger and complex machine. Who ever thought that it was a good idea to have corporations estimate their own pollution? @antialias It's a fair point to be that there is no great surprise in it being underestimated but at the end of the day if a corp wants to build a project they should be the ones to do the Environmental Impact Assessment (EIA), it's their project so they should pick up the tab. That said it is down to the regulator to challenge the EIA and the basis of any assumptions within it. @antialias_physorg PM harper thinks it's the best idea... also to muzzle scientists is a close second. if a corp wants to build a project they should be the ones to do the Environmental Impact Assessment (EIA), it's their project so they should pick up the tab. Sure they should pick up the tab...but don't you think that having their own people perform the assessment puts them in a pretty huge conflict of interest? You know what? What is the difference between mountain top removal or oil sands. Not much. Stop the entire process. Stop the global process of any form of hydrocarbon extraction. See how long you survive. I give it a week. Maybe two. Not all oils go into energy. In fact a very specific crude oil is required for petroleum and energy production. Most/many oils are used for MATERIALS, which cannot be made by wind, solar, or geothermal. With sufficient amount of energy you could produce most of materials just from air and water with reversing the carbon and nitrogen cycle. The organic chemistry is fantastic just by the fact, it requires mostly carbon, oxygen, hydrogen and nitrogen, which are all contained in the air (as plants already "know" quite well). It just needs a source of energy, like the cold fusion, it's research being more specific. Most of consumption of raw sources is connected with production and distribution of energy (neodymium for wind plants, indium for solar plants, copper and steel for grid and so on). But the replacement of these sources with cold fusion would mean, that many jobs in existing industry would become useless too - and this is the problem. I agree with your point Nestle, but making hydrocarbons from the constituents is a very energy intensive process. Also, you WILL get nasty byproducts and all kinds of volatiles coming off through those synthetic processes, as we currently don't have the technology to physically at will attach each atom individually into a compound of interest. Instead we get pre-cursors and use many methods of reflux, extractions, precipitations, fractionations etc to get to our final wanted synthetic compound, making a lot of byproduct mess along the way. Sure that can be made back into constituents using energy, but you're grossly exxagerating the capability of wind and solar here. These are heavy industry techniques requiring massive amounts of power, not a trickling amount of power. Most/many oils are used for MATERIALS, which cannot be made by wind, solar, or geothermal. That's a pretty inane argument. "We cannot change on a dime so we must never change". Is that really the argument you're going for? Really?